The Jackson Blocks collection combines a casual look with pure comfort. The densely filled comforter and matching shams are made from pieced microsuede that comes together at each seam with pintucking details for added dimension. The large blocks of color bring warmth to the look of the set with deep red, taupe, chocolate brown and ivory colorways while the microsuede gives a soft comforting feel to the top of bed. A brushed fabric back provides a more matte look to the reverse of this cozy set. Three decorative pillows in corresponding colors give small added details to this collection to give it a complete look. I seldom rate any product as excellent as I think there is always room for improvement. That being said, I love this comforter. I bought the King size for my Queen bed. I don't need the bed skirt as my bed is on a wood frame. The comforter overall is soft, both sides. The outside is microfiber, which is fantastic with my dog and cat. No snags, easy to clean. I had a comforter similar to this and it washed in the machine with no problems. Just make sure you have a big dryer as it will melt if there is not enough room to tumble, (Previous experience with this microfiber fabric) The inside is a soft fabric as well, although it is not microfiber. The colors are melon, deep rust, taupe and beige. Exactly what I was looking for, perhaps brighter colors than I expected, but pleasantly surprised. This comforter has a feature I was looking for which is the extra stitching to keep the batting in place. My last comforter had the batting moving all over the place, which is why I got this one. It comes with three pillows, two square and one oblong. Love them. The stitched design on the oblong pillow is leaves with acorns. It is a good fit for both a manly as well a feminine touch. It is light to medium weight. I don't like heavy comforters. 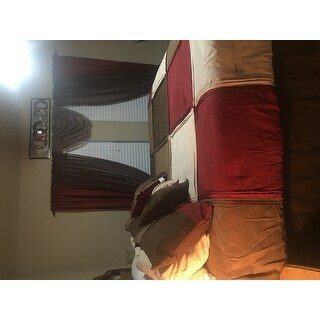 The price was about $10.00 to $20.00 cheaper on Overstock than on other sites with this same comforter. Plus free shipping, an added perk. The shipping was fast. There are a few threads here and there that need clipped as mentioned in other reviews, but nothing that would stop me from purchasing this set. I am tempted to change my good to excellent. It looks fantastic with all the pieces (less the bed skirt). I would definitely recommend and would purchase this same type again. Pretty but thin, thin, thin. The quality of the fabric is great, the colors are beautiful, the pillows are great...but...the comforter itself is as thin as a throw blanket. It was like they were too cheap to actually but any fill in the middle of it. It does not look as thick as it does in the pictures and is not by definition a comforter, it is a bedspread. LOVE IT !! !1 SO COMFORTABLE I CANT BELIVW IT TOOK ME SO LONG TO GET ! I have a king sleep number bed and it is not quite long or wide enough. It works but you must make sure to get it perfectly placed. I find this problem with most comforters. The only other problem I could see for some people is that the white is more of a cream color. Picture is deceiving however it works well with the rest of my decor. Someone who really wants it to be white would be unhappy. The colors are rustic and go well with our bedroon decor. The comforter is a very nice weight and after two weeks of use we're pleased with our purchase. I would like to say though that the over hang at the foot of the bed could be longer. We bought it in queen size, 90" X 90" (which is a popular dimension for queen size), and we're using it with an 11" thick queen mattress. It could use more length and I would say another 6" would be about right. We're pleased with the quality of the Madison Park product and when it comes time to replace it with a lighter weight setup for the Spring and Summer we will look at Madison Park offerings again. However next time around we will look for something with more length, maybe even a king size instead. I bought the Spice color set. The good news = Actual colors are more vibrant than the picture; comforter is VERY warm; and the pillows are lovely. The negatives can be fixed = long pieces of leftover thread hanging at the ends of much of the stitching, and it takes about 2 weeks for the wrinkles to "rest out" of the comforter. 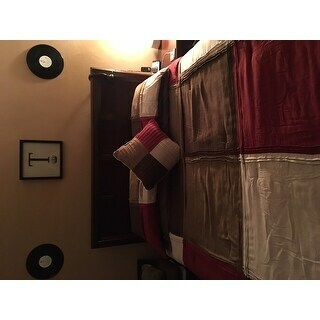 One or two of the reviews I read stated this was a very light comforter, more like a bedspread than a comforter. I was looking for exactly that. This set looks great on the bed, and I am very happy with my purchase. I was looking for a new look for my bedroom and this comforter set caught my eye. It looks fantastic!! I painted the wall behind my bed brown and sponged a dark brown metallic paint over it. My bedroom looks HGTV worthy. This comforter set is soft, warm, and cozy. I would highly recommend it. Bought this as a gift for my daughter, the colors were perfect. She loves the material because she has two cats and it does not snag. Perfect for the animal lover. I love the look and colors. A couple reviews I read said that it was very thin. I didn't feel like it was too thin. It is very comfortable. The only issue I had was I originally ordered the Queen set, but had to exchange it for the King set. The Queen set didn't hang down enough on the sides. It just didn't look like it fit right. I didn't have any problems making the exchange. I am 100% satisfied after making the exchange. Love this comforter - warm, cozy, pretty. However, it has taken a couple of hours to carefully iron it so it doesn't look too wrinkled, which was extra tricky because the care instructions say "DO NOT IRON." The throw pillows weren't wrinkled but the shams, bedskirt, and comforter were definitely not attractive until smoothed out. Once unwrinkled, though, it looks great. I ordered the king size set in red. Fits the bed nicely and the colors are exactly like the picture. The colors are a great combination of neutrals with just enough red for a pop of color. I did not have uneven seams or lose threads like a few other reviews stated. I am very pleased with the purchase. beautiful set in every way, but there was defective stitching in the box pattern so I had to return it. This comforter is very warm and comfortable. However, I have pets and the fabric really attracts pet hair and is difficult to remove. If you don't have pets you allow on the bed, this is a very nice comforter set. The bed was purchased for a room in our new home. It is well worth the price that I purchase for all of the items received in this package. I was very impressed with the vibrant colors. It's beautiful and has such a "rich look" to it and the colors are so nice! Am satisfied with everything about it, including the additional pillows that match so well, but I'm using them in other rooms! Sorry the picture came out sideways. Adds a lot of splash to my bedroom very comfy and soft. Washes up nicely and is super easy to clean. I would definitely purchase this or one similar to it. I absolutely Love this set. It has a feeling of suede and very “snuggly”. So much so, you may be late for work on occasion. Luv luv it!! Madison Abigail product was not good. Short on the bed. "I've read that the Queen size comforter is a little short on the bed (90"X90"). I noticed that the king size is 104"X 92"...only 2" longer. Is the pattern such that you could place the comforter with the 104" as the length..? Thanks!" I don't have a problem with the legnth but I don't see any reason why you couldn't use a King and turn it around. In fact I think that is brilliant. "Is the color on the red set really dark red or rust?" My monitor shows dark red, but this is very popular and an owner could better describe it. "No" on rust. "Yes" on really dark red. Not sure I know what difference between burgandy and maroon is, but I describe this color as dark, rich red. Looks great. "Will the Maddox set in Queen size and Spice color be in stock again?" Hello BayAreaGal, items are restocked as they become available; however, we cannot guarantee an item will be restocked. Thank you for shopping with us. I like the colors and pattern and need a new comforter. Style & colors were what we wanted. Price & reviews were good. 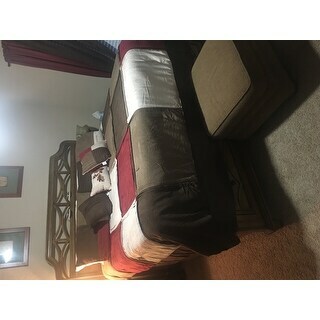 We actually currently have the same set in queen and like it so much that when we decided to upgrade to a king size bed we made sure we can get the king size set before committing to the getting the king size bed. "Is this available in spice king? I can't find it anywhere on this site or the internet?" Hello shanna_groves, unfortunately, the king size Spice set is out of stock. Items are restocked as they become available; however we cannot guarantee an item will be restocked. Thank you for shopping with us. "I have a queen size bed but after reading some of the comments I'm not sure whether I need a queen or a king comforter. Can you assist me in this choice?" Thank you for contacting us, smudge. If you have a Queen size bed you will need a Queen size comforter. Please let us know if you have any further questions. "I am concerned that the comforter is thin based on some of the reviews. Does the comforter have stuffing or is it very thin (like a quilt)?" Thank you for your question, countrygal27. The Madison Park Maddox 7-piece Comforter Set is definitely not a comforter for cold climate and there is filling more so than the coverlet. The poly fill weight for queen size is 3.1 pounds and the king size has 3.67 pounds, plus the fabric weight. It is intended for all season comforter. Have a great day. It has stuffing but not a whole lot. It is not very wide and doesn't hang over the edges of the bed very far when both my husband and I are under it.